Parties are great during the holidays and at other times of year, and it is lovely to have a wide variety of tasty treats available for little guests to enjoy. Having a get-together is a wonderful opportunity to introduce children to an array of different types of fruits and nuts that they might not have experienced yet, or may have seen as a whole piece of fruit (eg a nectarine or a pineapple), but not in small bite-sized pieces. 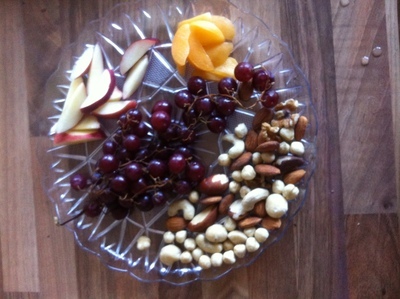 A fruit and nut platter can make healthy options more appealing for young children (of course, make sure you have no little guests with nut allergies before including the nuts, and adapt as needed) who can pick at something healthy alongside their favourite sweet treat and learn how to alternate sweets and more healthy options at parties. Some people I know even only offer fruit and nut platters and savoury food at the beginning of a party, saving sweets for once a main meal has been eaten, teaching children that moderation in sweets is the way to go. Put the nuts on one side of the platter to start. 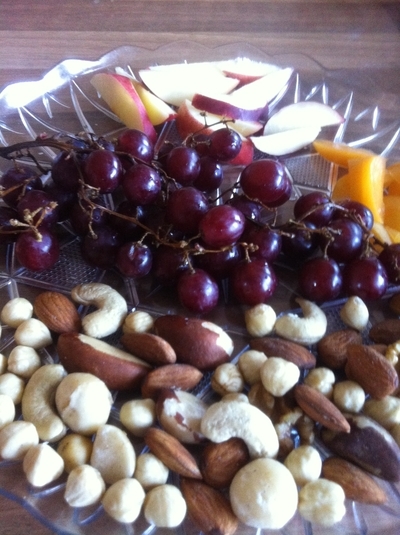 Lay grapes in the middle as a dividing line between nuts and other fruit. Cut up seasonal fruit and arrange on other side of the tray. Cover with cling wrap until serving to keep fresh and prepare as close to serving time as possible. Where are you dreaming of going on holiday?